Please come help us make a difference ……volunteer at our regional science fair! 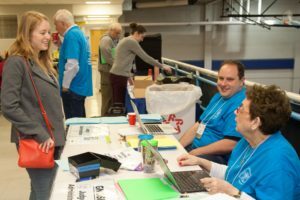 Event volunteers are needed for the 2019 Greater New Orleans Science and Engineering Fair, which is open to middle and high school students in Orleans, Jefferson, St. Bernard, and Plaquemines parishes. It is one of the largest fairs of its kind in the state of Louisiana with over 300 students expected this year. Many opportunities exist to engage with bright, motivated 6th through 12th grade students who are our future of science, technology, engineering and math (STEM)! Volunteering with event operations is one such way, and helps facilitate this exciting opportunity for our area students. The 2019 Greater New Orleans Science and Engineering Fair will be held at Tulane University on February 18th, 19th, 20th and 21st, and volunteers can assist in a variety of ways shown below. Each position provides a description of the general responsibilities and timing. Sign up as an EVENT VOLUNTEER below! If you would prefer to volunteer as a PROJECT JUDGE, click HERE!!! Questions? Contact us at gnosef@tulane.edu.